One of the great joys of having backyard eggs is being able to make marshmallows from scratch. Homemade marshmallows are completely different in texture to bought ones – they’re soft, pillowy and very moreish. I wrote a detailed tutorial on making marshmallows four years ago, but this was our first (and second) attempt at making flavoured ones. If you’ve never made marshmallows at home, I’d definitely recommend giving them a go. Remember to start with the freshest eggs you can find! Your marshmallows looks amazing. They would give rocky road a delicous flavor. Manuela, they really do! The texture is lovely as well – it makes a much less chewy rocky road than regular bought marshmallows do. I just pulled up my passionfruit vine; what variety do you have? Your marshmallow do look so luscious! Elaine, I don’t know! It’s growing over the fence from the neighbour’s side – we just get the benefit without the work! :) And no sorry, I haven’t made tea bags, but it’s an interesting idea! Can you hear me going ‘mmmmmmmm’ as I eat a passionfruit marshmallow, an imagined sensation, dreamy pilowy passionfruit clouds. Cheri, they’re fun to make, but it helps to have an extra set of hands on board! G’day! Love making marshmallows Celia and love the combination of raspberry and passion fruit! Joanne, they’re quite delish, although the passionfruit ones were definitely the favourites! These look amazing! I have just started getting into marshmallows again and was thinking of making a marshmallow slice. I might use this recipe for the marshmallow part! I’m not sure how these would hold up to baking, if that’s part of the recipe? Mmm- coming here is such a food adventure in the nicest and most homely way. Jody, chickens! That’s very exciting, when are you getting them? Glenda, we really like the egg white version, it’s much softer and completely different in texture to bought ones. Having said that, I think they have a much shorter shelf life. That wouldn’t matter in our house :) How long do you think? What a great idea. I haven’t made marshmallow since I was a teen – and back then I had to do it with a rotary beater. Boy, was that hard work! I’ve got loads of eggs and ALL the technology now, so no excuses! I never seem to think of marshmallows when I have egg whites left! 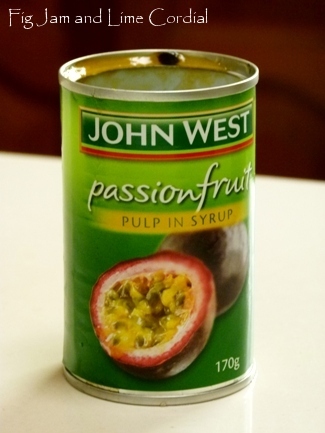 And I’m so excited to see passionfruit in a can – I didn’t realize it could be bought that way! I may have to look on Amazon. As you can imagine, passion fruit is out of this world expensive the few times I’ve seen it in the store! Well, the price here prohibits me from buying the fruit when it does show up, so I’ve never actually tasted it before unless it was already in something, like a Sorbet from the store! And I love Pavlova, but it generally ends up being strawberry up north, here! Oh I so hope you find some! Over here the little tins are only $2 – $3 each! The pulp is made in Peru (I doubt locally made pulp would be as cheap). 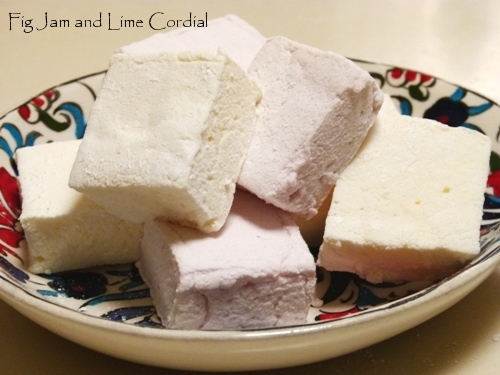 I love passionfruit, raspberry AND marshmallows… but haven’t made home made marshmallow since I was still married and my kids were living at home! Yum, Celia, just yum! What a a great recipe,I might even make them this weekend,,yum..
Yum. The first time I ever made marshmallows was in Food Tech as high school. I loved homemade marshmallows then, and I love them now. These look delicious Celia. i was just saying to my husband last night how much i’ve been wanting to make homemade marshmallows – talk about perfect timing! Celia, this looks perfect! When do you add the passionfruit? Shanna, at the same time as we added vanilla in the original recipe, so after the gelatine. Thx can’t wait to try then :) a few tablespoons a suppose will do the trick? That’s all we ended up with, once it had been reduced down to a thick jammy consistency. on October 23, 2014 at 11:03 pm Platanos, Mangoes and Me! This is something that I want to make an now I have all I need. Thanks Celia! Very nice mallows! Love the flavours you chose, too! Thanks Julie, we were just experimenting. The passionfruit ones are the bomb, the raspberry were nice and pink, but didn’t nearly have the same flavour kick! I love home made marshmallows! They are so different and so much better than the stuff you get at the shops. They really are so much nicer, aren’t they! They look divine. My recipe doesn’t use egg whites, which is possibly why my marshmallows look a bit lumpy compared to yours, so I shall give the egg white recipe a go as home made taste so good. Plum flavoured is good too. You’ve certainly got the gelatine you need, Annie.. :D I’ll let Pete know that we need to try plum when it’s next in season! There aren’t any fresher eggs than straight from the nest at first cluck and warm. Seriously, ANYTHING raspberry and passionfruit is a winner Celia but marshmallows? You are a true gourmet traveler with your cooking exploits :). If Steve liked marshmallow I would use up some of the (currently 10 dozen) eggs in the fridge but alas, he doesn’t so back to the drawing board. I am thinking about pickling most of them in a large jar and pretending that I own a fish and chips shop or a pub where I am sure Stevie-boy will be MOST happy to imbibe said eggs. Fran, what are you going to do with your eggs? ;-) Pickled eggs do sound nice – I think Maggie Beer has a recipe for pickled quail eggs which you might be able to adapt? Lury, I’ve never thought of making chocolate ones! Thanks for the idea! i’ve never thought about making marshmallow before but these really have me thinking that i’ve missed out on a great thing. The texture looks so different from what you see in packages and more like a treat that i would eat, especially the flavored variety. nicely done Celia. I discovered the delights of homemade marshmallows earlier this year. My neighbour’s little girls were delighted when I was recipe testing to get my recipe right. I make mine without egg whites but might have to try your method as I have some spare egg whites in the fridge. I’ve made strawberry ones but I adore the sound of passionfruit. I will have to try this. You must try chocolate. They are absolutely deluxe with Valrohna Cocoa powder. I rolled mine in spiced cocoa powder to finish. Divine. The egg white ones are completely different – reminiscent of the topping on a lemon meringue pie. We’ve since made sour cherry ones! Emily, the little tins are so cheap here – under $2 each and almost everyone has one in their kitchen pantry. I wish you could find them there! 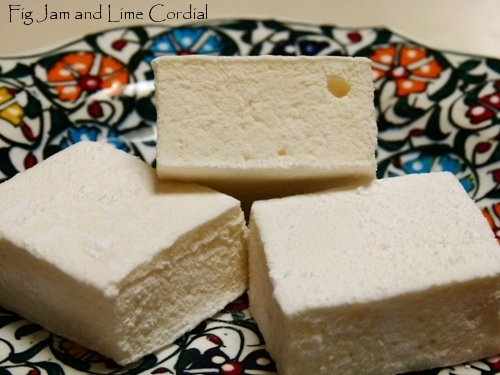 I’ve been wanting to try making homemade marshmallows and this recipe is my inspiration to just go for it! OMG Celia – I want these now!!! Two of my favourite flavours!!!! Oh these look absolutely gorgeous! I would want to eat the whole batch! Never thought of making marshmallow – you have inspired me and the passion fruit flavoured ones really appeal! Tanya, they’re great fun to make! And you don’t need an oven..hahaha! M, I don’t know how these would go in the microwave – isn’t that how you make peeps? This looks great! I tried making marshmallows for the first time last Christmas. I made lemon and marshmallow filled biscuits, and homemDe wagon wheels. I think I can improve on my efforts. Homemade wagon wheels sound like a brilliant idea! Becca, all the flavours are subtle, but the raspberry especially so. We’ve just tried sour cherry and it was divine! I didn’t realise until I started reading the comments to this post how lucky we are to be able to get passionfruit so readily! The boys have been asking for homemade marshmallows lately. This gives me the extra push I needed!